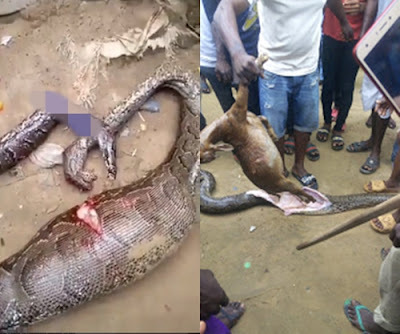 A big python snake who made a bold move and entered someone's complex and swallowed his sallah meat, was captured by locals. In some photos that have appeared online and are circulating on social media, the inhabitants of the Vespa market area in Ijanikin (Lagos State) have been seen opening up the belly of the reptile and getting out of it. goat. 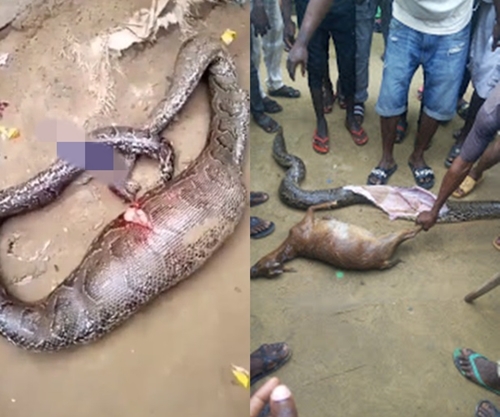 It was gathered that the massive snake ended later inside several people's pots as they celebrated Sallah's holidays with more meat.